In The Business of Creating Family Memories & Providing Healthy Homegrown Food. When are apples ready to pick? › Our apple picking season starts the last week of July and runs to the beginning of November. U-Pick will begin the first of August. What other crops are grown at the orchard and when are they available? As crops are ready for picking, information on picking will be posted on Facebook. 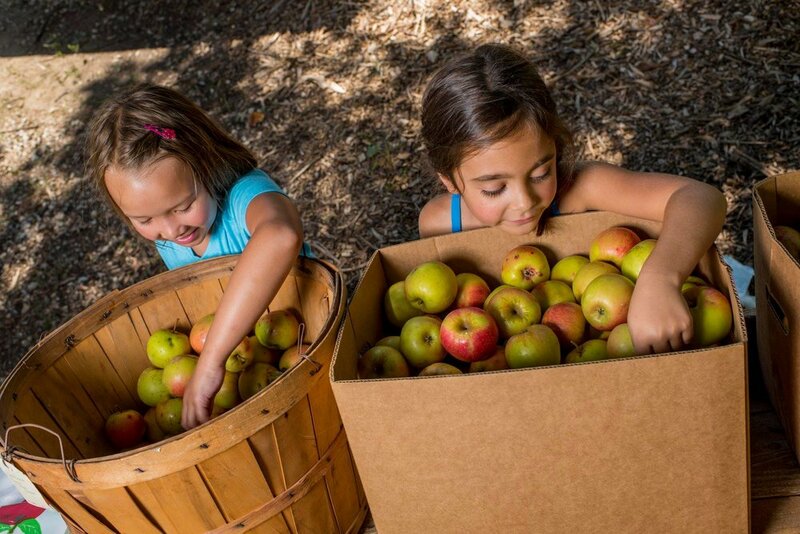 How does a U-Pick apple orchard work? › Once parked proceed directly to in front of the barn. Underneath the large tree between the barn and the house you will find an apple stand with orchard employees (in the red shirts) discussing what apples are being picked and distributing apple bags. Our apples are sold by the bag and not by the weight. After you have a picking bag please proceed to the hay wagons to take you out to the orchard. If you decide to walk instead of ride, please make sure you know where we are currently picking. Are guest allowed to bring dogs to the orchard? › Yes, dogs are welcome as long as they are friendly and on a leash. Do you allow photographers to use the property for photo shoots? › Photographers are welcome to use the orchard for photo shoots during regular business hours. Any access to the orchard outside of business hours will need to be pre-approved. Is there an entrance fee to the orchard? › There is no entrance fee. Are there fees to park? › There is no parking fee. Can we bring a picnic lunch to eat at the orchard? ›Yes you are welcome to bring your own picnic lunch or purchase food at the orchard. What is the best way to inquire about hosting an event or having a wedding? › You can complete the inquiry form on our website or send a request for information directly to ciderhillfamilyorchard@gmail.com. How will I know when my favorite kind of apple will be ripe? › Apple ripening times vary depending on the weather. Instead of putting out a specific ripening schedule; we post what apples are available every Thursday on our Facebook page. Why do you not have your trees in the orchard labeled? ›All the apple trees we have planted are clearly labeled. When we purchased the orchard in 2011 the types of trees in the orchard was not clearly defined. We have learned to identify most of the trees but some are still a mystery.